White House lawyer Emmet Flood arrives for a meeting on Capitol Hill in May. He's seen as the leading contender to replace White House counsel Don McGahn, who will step down this fall. Emmet Flood, the lawyer inside the White House whose job it is to deal with the Russia investigation, is preparing for battle on ground where he is uniquely qualified to fight. "He is a legal expert on all these issues about subpoenas, presidential privilege, Article II of the Constitution," said Rudy Giuliani, one of President Trump's outside lawyers. When Flood joined the Trump White House in May, he was a big get for a president who has struggled to build an A-list legal team. Now he's being discussed as a possible replacement for outgoing White House counsel Don McGahn. Flood's arrival in the White House marked a turning point in cooperation with Robert Mueller's special counsel investigation. Some three dozen White House aides had already voluntarily sat for interviews and thousands of documents had been turned over. But that was changing. Trump's personal legal team wasn't in a rush for the president to sit down with Mueller's investigators. And inside the White House, Flood put his foot down about another interview the special counsel wanted, this one with chief of staff John Kelly. "He correctly, in my opinion, declined," said John Dowd, a former member of Trump's legal team who is still in touch with the president's lawyers. "There was a request for an interview with John Kelly, and he handled that because the chief of staff works for the president, and he told Mueller he couldn't interview his chief of staff," Dowd said. Saying "no" to investigators who have their sights on the White House is a specialty for Flood, something he's done for two prior presidents. "He is as experienced and knowledgeable about impeachment proceedings and separation of powers, executive privilege those kinds of issues as any lawyer in the country," said Glen Donath, who worked closely with Flood as part of President Clinton's outside legal team during the Starr investigation and impeachment trial. "Through his experiences and through his temperament, he's aggressive and protective of presidential prerogatives," said Donath, who is now a partner at Clifford Chance. Flood also brought that approach to his work for the George W. Bush administration. 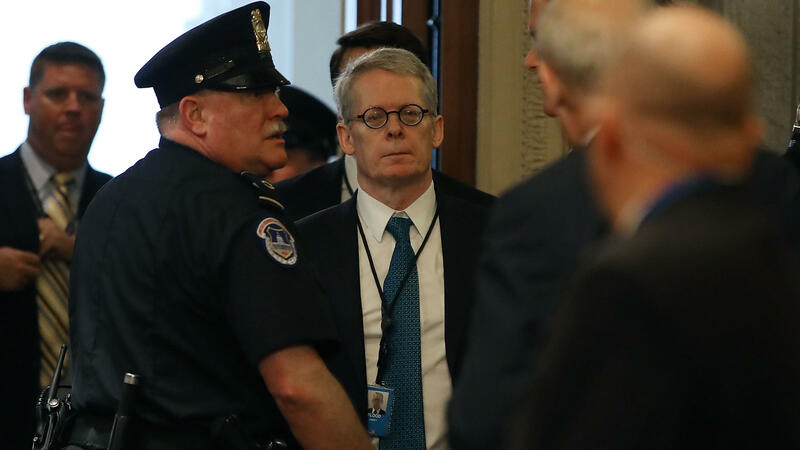 Congressional Democrats were investigating the administration's firing of U.S. attorneys, and Flood, then in the White House counsel's office, wasn't about to make it easy for them. Elliot Mincberg was chief oversight counsel for the House Judiciary Committee at the time and was trying to get the documents and testimony that Flood refused to hand over. "He was a very strong defender of the argument that that information should not be provided, even though he was under subpoena from the House Judiciary Committee," said Mincberg, who is now a senior fellow at People For the American Way. "We wound up having to take that dispute to court." And the dispute continued even after Bush left office. What does this mean for Mueller's investigation? At the moment, negotiations over a possible presidential interview with investigators appear to be at an impasse. Giuliani tells NPR it's been three weeks since Trump's outside lawyers made their last counteroffer to Mueller's team about a presidential interview, and they still haven't gotten a response. So, while Flood continues to field the occasional request from the special counsel team, Giuliani said Flood is also preparing for a fight. "His overall work looking toward a subpoena fight is to supervise the research that will be necessary should they subpoena [Trump], if we're not able to reach an agreement," said Giuliani. If past is prologue, that fight could be epic. "If the president and his personal lawyers decide they don't want to do an interview, it won't happen on Mr. Flood's watch without a court order, because he will zealously protect the president's prerogative whether or ultimately that prerogative is judged right or wrong by the courts," said Mincberg. When Trump announced White House counsel McGahn would be leaving in the fall, the one name that came up more than any other as a possible replacement was Flood. "People like him, he's super well respected around the building, but there isn't a plan locked in place at this point," said press secretary Sarah Sanders, pointedly not denying the Flood for White House counsel rumors. One significant thing Flood has going for him: In his short time in the White House, Flood has earned the respect of the president, too. "I know from the president and from other people I talk to that he is very pleased with Emmet Flood," said Dowd. "They have a good relationship." It's not clear whether Trump has offered Flood the job or whether Flood would even accept it, given the risks. But those who know him say he'd be good at it. "He'd be my first choice to have the ear of the president in these times," said Shannen Coffin, who served with Flood in the Bush administration and is now a partner at Steptoe and Johnson. "You know, he's very reasonable and calm in times of crisis. And I think you know, there's a surfeit of crisis here." But that excessive amount of crisis in and around the Trump White House could ultimately be what prevents Flood from taking on the larger role. "I think Emmett Flood could do anything. He's a terrific lawyer. It's a shame, but one of the things that might hold it back is he's so important in what he's doing, we'd have to get somebody else to do that," said Giuliani. "That's up to the president and him."